Opening Day has once again arrived for Major League Baseball, bringing with it the freshness of spring and the warmth of summer. The excitement of a brand new season instills a sense of euphoria in fans, and reminds them the long days of summer are not far behind. 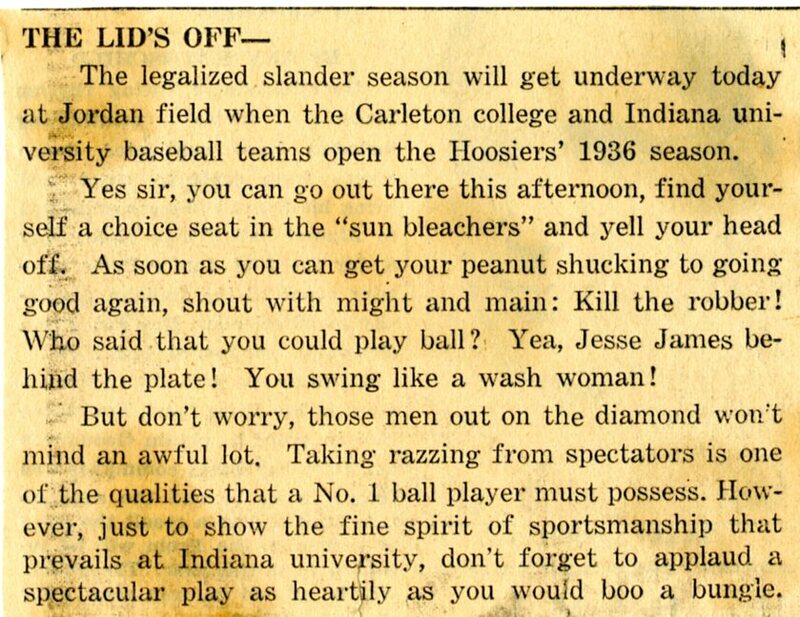 An April 4, 1933 clipping from the Indiana Daily Student captured the excitement of a new baseball season for students, declaring unkind those professors who dared schedule exams on the day of the first game. As teams emerge from their winter hibernation and make their way back to the diamond, they will begin preparing themselves for both the physical and psychological rigors of the game. For superstitious players in particular, the baseball season can be a grueling stretch of routines and beliefs intended to build confidence and ward off bad luck. 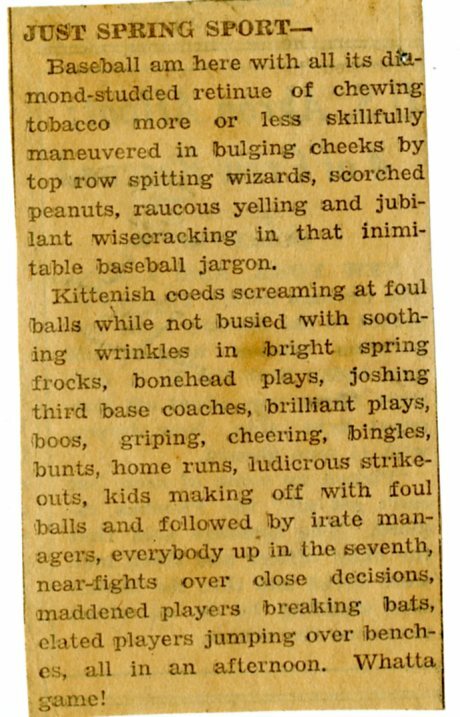 Baseball superstitions are as old as the game itself, and the very mention of the word brings a feeling of unease among players and fans. While some are humorous, some have become so ingrained in baseball culture they are now enforced as law. Lyle Green notes some basic superstitions include never stepping on the foul line when walking on and off the field, and above all never mentioning an in-progress no-hitter. Carl Erskine, a native of Anderson, Indiana, pitched for the Brooklyn/Los Angeles Dodgers from 1948 to 1959. When he was interviewed in 1973 as part of a folklore class at I.U., Erskine detailed the near paranoid levels of superstitions prevalent at the Major League level. Some of the more trivial include the Dodgers’ Leo Durocher, who as third base coach would kick third base before taking his position. Dodgers pitcher Billy Lowes was adamant on sitting in the same spot in the dugout, and always wore the same clothes when he was on the mound. Chicago Cubs first baseman/outfielder Phil Cavaretta would take two warm-up swings of the bat while in the on-deck circle. Before taking a third swing, he would spit in the air, and then hit it. “Splat, and he was ready to hit,” Erskine recalled. Though he was surrounded by superstitious players, Erskine himself stated that while he tried avoiding becoming engrossed in superstitions, it was nonetheless challenging to prevent being swept up in them. “It’s so difficult that I found myself not going to the same seat on the bench, not wearing the same sweatshirt every time I pitched, not walking back the same way each time, to the point where one day I realized…well, I’m being superstitious about not being superstitious,” Erskine said. Superstitions can be found everywhere on the diamond, including food. Good nutrition undoubtedly keeps the body healthy and in top physical condition, but for the superstitious player it can be the difference between a memorable day at the plate or one better off forgotten. Jay Grohowski, an I.U. baseball player interviewed in 1981, noted the effect something simple like a pre-game hot dog could have on a player’s day. A good meal can certainly keep a player calm, but where the food is consumed can be just as important. Harold Halman, another I.U. baseball player, discussed the role of McDonald’s for a player’s success. “So happens you go out, the team does well, and you play fairly well, and next day you go there. ‘Let’s all go to McDonald’s, like yesterday,'” Halman said. Superstitions can take hold of fans in ways similar to players, though their rituals morph into a communal effort intended to will the home team to victory or support an individual player’s effort. From turning hats inside-out during rallies to tapping bobbleheads, fans become consumed in the moment, and almost work harder than the players themselves to snag victory from the opponent. 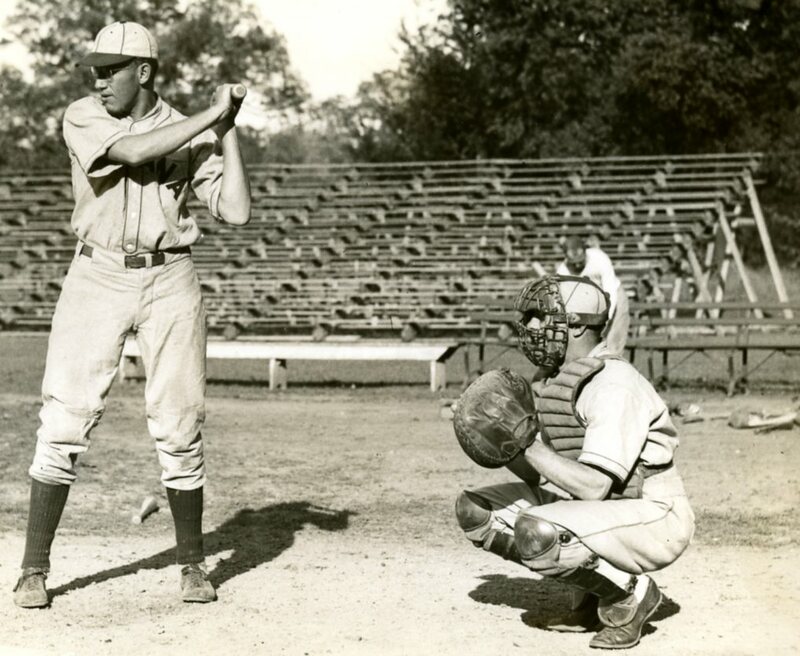 While Erskine’s mother was listening to her son throw his first no-hitter in 1952, she continued ironing the same tablecloth throughout the entirety of the game, believing any attempt to stop would squander Carl’s efforts. The beginning of a new baseball season signifies the oncoming days of spending long summer days basking in the sun at the ballpark. For teams and fans looking to keep bad luck at bay, the strains of the game can result in habits and routines seen as bizarre by outsiders but viewed by player’s and lovers of baseball as being essential to keeping a level head when out on the diamond. Both the the IU Folklore Institute’s student papers collection and the IU Athletics Manager’s Books were mined for this post. If you follow those links, be warned – the student papers collection is HUGE and takes a long time to load. Click “Entire Document” on the left and then walk away for a bit while it loads!